Porto is a special city given its history, amazingly rich architecture and beautiful setting on the steep banks of the River Douro. 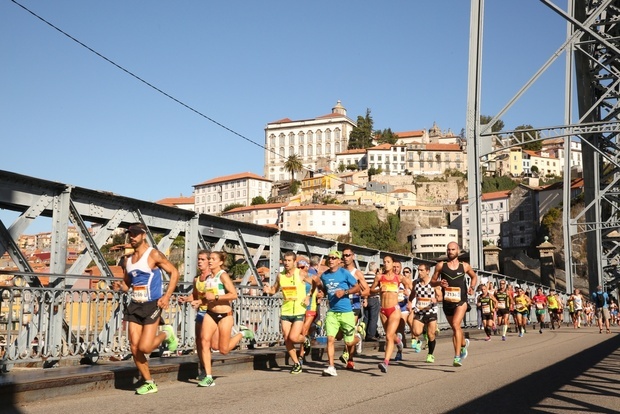 Luckily the half marathon avoids all those hills and sticks to a lovely flat course along both banks of the Douro. You won’t find a more beautiful running course. The views of the cities – Porto and Vila Gova de Gaia, along with the huge bridges that span the river are spectacular. Now in its 9th year, over 15,000 competitors took part from 38 countries. The Kenyans won both men and women’s race – no top names but some guys past their best (a world cross country 2nd place man). My race went well – I set a new PB by 40 seconds on my last PB from 2012. My time was 1h18m57s for 87th place. I was happy to get a PB but had been targeting 1:16 and was on target for the first 0km. I felt good but kept telling myself it’s a long race, so to not push too hard. After crossing the Ponte Luiz I we ran along Vila Nova da Gaia side for 8km. the road had a few small rises and the cobblestones weren’t’ ideal in parts. Returning over the bridge at 13km I could feel the pace slipping. I had to maintain 3:36 to hit my target. I was over 3:40 heading to 3:45. I think the 3 marathon ion the Camino the previous week were still weighing down my legs – not ideal but c’est la vie. I kept trying to push but the 15km turnaround took forever to arrive. I kept believing my last 5km could be fast and while I got in a group with 2 others, my pace was still 3:45 and I was working hard. Only my last km did I get back to 3:36 and that was flat out. Ultimately I’m happy – it’s a PB in a beautiful city. A great experience and I’d recommend the race as a perfect weekend away.